Hello Aneta, thanks a lot for submitting your work to Women in Photography. Can you tell our readers a little bit about yourself and how you got into photography? Hello, I am a photographer based in the Czech Republic. I graduated from Tomas Baťa University in Zlín ( The Czech Republic) in Advertising Photography. We learned how to use technology and cameras in a creative way, as well the theory of art and photography. In our faculty were lots of fashion, graphic and industrial designers - I collaborated with them on many projects. I guess that was the beginning of my experiments with mixing medias. You submitted photos of your amazing project Recto Verso - „Imprinted“. There you print landscape on fabric and implement them to the real landscape. How did you came up with this idea? I was always interested in social and environmental engaged art. I believe that art and photography have power to highlight problems in an aesthetic way. I wanted to express my ideas about the relation between man and nature - it’s similarities and differences. So I came up with the idea of the Recto Verso project which means obverse and reverse sites of this relationship. It is divided into several phases and projects - where nature is involved in the process as well as technology. So „Imprinted“ is one part of this concept. I printed my personal landscape on fabrics and searched their characteristics. Then I installed them into different environments and explored the transformation of the context. Our identity is hidden and covered. Humans are partners of a nature not their enemies. You combine photography with other artistic disciplines. Can you explain us something about your work process? The process itself is more important than the final result. Speed and simplicity is the motto of digital cameras and mobile phones. Lots of theoreticians call photography almost dead. Photography has became a part of our everyday life - a part of consumption. These days we are surrounded by visual smog on social networks. For lots of people photography means only pressing the shutter. What disappears about photography is the process: long preparation, developing negative, enlarging etc.. Photographs lose their uniqueness and an emotional value. Pressing a shutter of digital camera is just the beginning of the process… Through duplicating prints, installations and other methods I am researching hidden potential of photography. What is your goal with this project? Through my project I want to highlight several environmental and social issues and approach them to people. I am very interested in public installations and exhibiting in public spaces because I believe that art can educate and enhance people. Not only small groups of art critics and artists - everyone who is willing to observe. Your photos are very well composed. How did you cultivate your sense of composition? For my project "Imprinted" I took all photographs during hiking. I took my camera, a tripod, all my fabrics and went to nature - sometimes alone, sometimes with a model. When I found a right place I took time to find good angles, positions and light. When I did self- portraits I used the self-timer. I was repeating this processas as long I was satisfied with the composition. Sometimes I had to stay covered, sometimes barefoot or without a jacket in the snow. I felt cold, itching by little branches. This physical aspect was almost a meditative process and very important to me, because I feel attached with the place I am working in. The best compliment would be if someone will be inspired by my work and I encourage him to do something on his/her own. I think its the greatest reward to see that somebody finds energy to do something or at least deeply think about it‚ because of your work. What do you enjoy most about being a photographer/ artist? For me photography is not only a profession, business or specific education. It’s a lifestyle. As a photographer you’re looking at more details, relations between objects, people and situations. You are more attentive! Even observing shadows on a leaf or on the wall can give me great joy. Tell us a bit about the photography scene in Czech Republic. Is there any work of female photographers you can recommend? Czech Republic is full of talented contemporary photographers, as well in a past (Sudek, Drtikol ect.). Lots of them are working abroad. A great documentary photographer Markéta Luskačová is workingin London, because we the Czech Republic is a quite small market. I also can highly recommend wonderful Bára Prášilová who is working into creative fashion photography, as well as Bet Orten. One of the best Czech young photographers is Tereza Vlčková with very feminine and unique vision. Hello Alina, thanks for submitting your work and taking time for the interview. Can you tell us a little bit about yourself? Hello, Nicole! My name is Alina Autumn, I am 23 years old. I'm from the city in Saratov, Russia. For me photography is a way to share my thoughts and feelings with people. I like to create tragic, sensual images of women. It is important for me that the photo tells a little story. Usually I create series’ of pictures which represent a complete project. I am inspired by natural beauty of people, nature, cinema, vintage, light, and color. When did you first become interested in photography as a mode of expression? Photography attracted me from teenage age, but I photograph people for the last three years. My muses are natural and fragile girls. I appreciate natural beauty, feminity and mysteriousness. I am facinated by the shooting process - I like to photograph especially outdoors. Did you have any formal education in photography or are you self-taught? I am self-taught. It took a while to find my style. When I began with photography the world and people have changed around me, this helped me to develop creativity. With my photography I can share with the world what I have in my mind and share the vision of beauty. Photography has helped me to see the world differently. Your portraits are very poignant and very well composed and each seems to tell its own story. Where do you get your ideas from? When I get the idea for creating a pictures, I do sketch or record this into a notebook. The idea is born incidentally and occupies all my thoughts. Then I begin searching for objects for the shooting. I think about clothes, details, location and color. 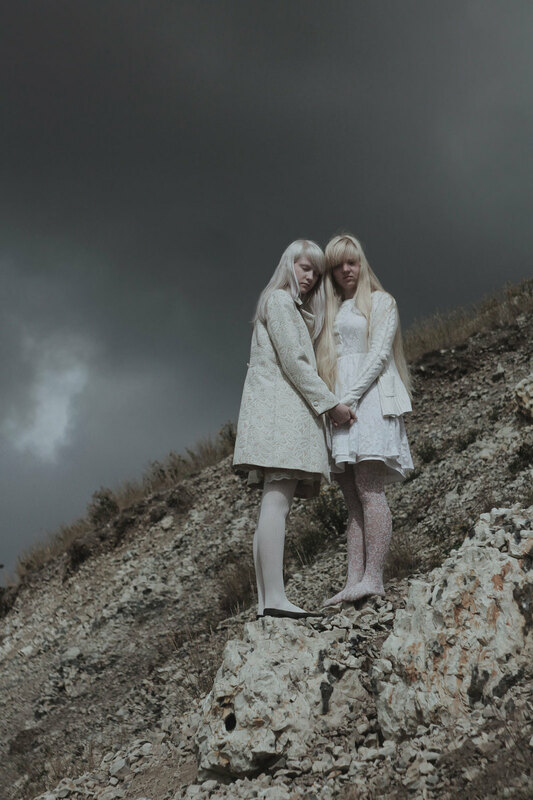 You submitted a beautiful photo series of albino girls. How did the idea for it come up? In this series of pictures "Light souls" I wanted to pay attention to harmony of the people and the nature. The choice of albino girls isn't accidentally. They look as if they were angels who have arrived from a far-out planet. 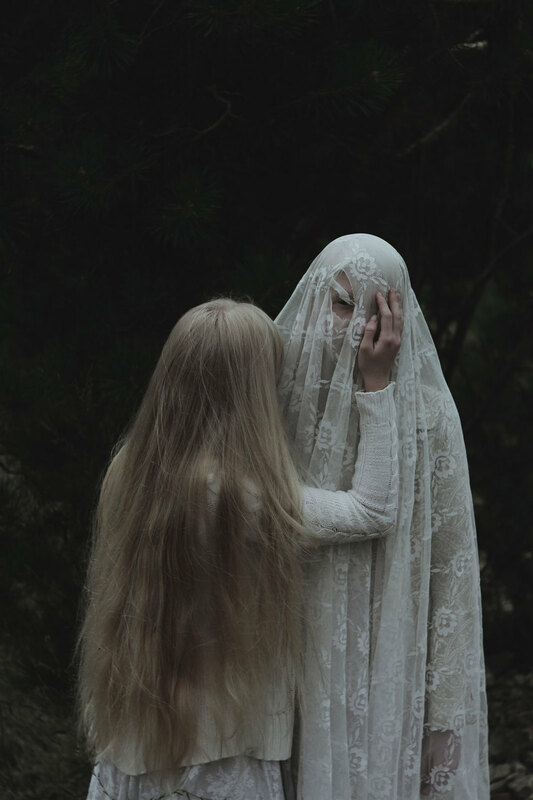 Albinos submit the mysteriousness and fragility, just like trees or the infinite sky. Besides sketches it is necessary to prepare an image in general. I pay much attention to clothes. Iusually choose them for the shootings individually. In the series "Light souls" I tried to show a new point by common clothes - they made the images of the girls complete. What is your intention behind your photos? For me it is important to develop my creativity, but not to loose myself and to inspire people. Photography will always be part of my life. Do you have any role models that your photography is directing towards? Marta Bevacqua and Monia Merlo. These photographers are able to reflect female beauty in all its variety. There is also a project of the Romanian photographer of Mihaela Noroc "The Atlas of Beauty" where she shares the beauty of women from around the world. I am inspired by the large-scale of projects devoted to a certain subject. In the future, I want to create a project like this - the first steps are already taken. Hello Dasha, thanks for submitting your work! Can you tell us a little bit about yourself? Hi, and thanks for your interest to my photography! I’m a conceptual photographer from St. Petersburg, Russia, currently based in Helsinki, Finland. I’m self-taught, mostly. I use photography for expressing myself. I’m not documenting reality, I’m documenting myself and my imagination in my photos. When did you first become interested into photography as a mode of expression and art form? I first tried to express myself by photography about 5 years ago. I was interested in photography before that, but mostly in street and documentary genres. I also had a day job, that was very far from visual arts, so I didn’t actually have time to even think, that I could be anything but an office worker. Then a major change happened to my life: my elder daughter was born. For some reason her birth produced a burst of creativity inside me. I had a friend who encouraged me to try something new in photography. This is how I started taking conceptual portraits. My images are stories that could have happened to the characters in them in some parallel reality. The stories come from my thoughts, observations and experiences. So, I could say, I tell a story about myself by visualising tales about my characters. Where do get the ideas for your work ? I try to see beauty in simple things and ordinary people and aim at showing it to the world. I do believe that we are constantly surrounded by miracles, but we do not recognize them because they come to us so gracefully and seamlessly. My work explores magic and beauty in ordinary people and simple things. Thus, I am very often inspired by people, things and places. Your work is very well composed! How did you cultivate your sense of composition? Thank you! I got so-to-say formal education in composition in an arts school, which I attended, when I was a child. Later on, I studied composition by looking through the work of great masters of photography: Henry Cartier-Bresson, RIchard Avedon and of cause, Rodney Smith. I never stop learning though and I feel, that I still have a long way to go in order to become a master. Congratulations for winning the Best of Russia Conceptual Contest! How do you feel about it? And do you think it is important for a photographer to take part in Contests? Thank you! It was a big surprise for me and I didn’t even believe it at first. And yes, I feel very happy and proud. I do think that taking part in contests is important. First of all, a photographer can get some valid appreciation and recognition of his/her work. In my opinion, this is crucial for any creative. We live in the times of social media and sometimes, even if you get 100 comments, saying that your work is amazing, it’s not worth much. But when your work is recognised officially by some authoritative jury, this is when you get self-esteem and strength to keep on creating. Is there a female photographer or a type of photography that influenced your work or inspired you? There are several photographers that influenced my works. The first is Anka Zhuravleva, a conceptual photographer from St. Petersburg, currently living in Portugal. Her work is incredible and I can say that her photos made me turn to conceptual shooting. I was amased by the fact that her photography fairytales were created in the very same city where I lived. I was so close and therefore seemed possible for me as well. Another big inspiration is a female photographer, known as Sparrek. She is from Tallin, Estonia. There’s such depth in every one of her works. And once again, I’m in love with Rodney Smith’s photography. He’s an endless source of inspiration for me as well. I’m working on several very interesting projects with other visual artists. I’m not publishing anything about them yet, as I really want to collect some more material first. Now I can only say that they will explore human psychology in a way. Or should I say female psychology? As my models are generally young women. I also want to continue sharing my inspiration and skills with other photographers. I organized my first two-day workshop on creative photography last February. Now, I’m planning to organize a few more and also I’m working on a program for an intensive four-day course in creating concepts with a camera.